After the successful day at the Nene Valley Railway, it was decided we should have other events; white water rafting, tank driving , parachuting, sailing tallships, etc. 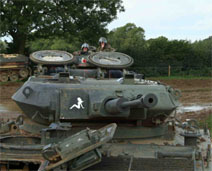 We plumped for tank driving, while we had an excellent time, only six members went. The Association membership had made it clear it was steam or nothing. Time to pop the white water rafting on the back burner! 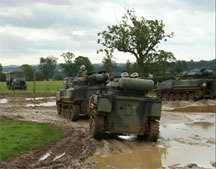 CAA members practicing handling the tanks in the mud before the battle.